Welcome to the Days Inn Orange Park/Jacksonville. 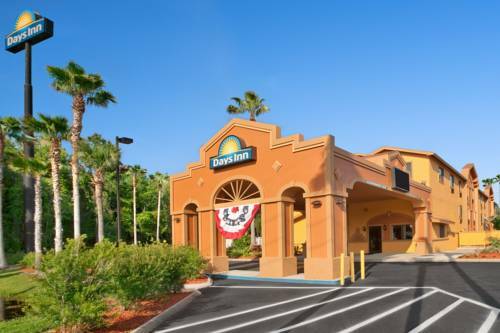 Our three-story hotel is conveniently located within minutes to Jacksonville and surrounding areas, with easy access off I-295 exit 10. Our 57 Room interior corridor hotel is furnished with your comfort in mind, but please note that we do not have elevator service. Our rooms feature one King, one Queen or two Double Beds. At the Days Inn Orange Park/Jacksonville, enjoy our complimentary signature continental breakfast service, Daybreak Lite, in our lobby. We also provide the USA Today newspaper free. In addition local phone calls are free of charge. Enjoy free coffee in our lobby anytime you need it. Travelling with children, Kids 17 and under, in same room as parent, stay free. If you feel the need to relax and unwind, why not spend some time by our sparkling pool and sundeck. Should you need to take care of business while visiting us, we offer Free Wi-Fi access throughout the hotel. We are the closest Days Inn to Orange Park Kennel Club, and for those who love to shop, we are located just minutes from more than 135 shopping choices, restaurants, movie theatres and much more. The Jacksonville Naval Base is only 1 mile away. Football fans, we are only 12 miles from Jaguar Stadium. Truck Parking available for a fee. You can bottle your own regenerative elixir at the fabled natural spring -- for a fee. A classic tourist attraction. ~30 miles from Orange Park. ~31 miles from Orange Park. The USS George Bancroft, a full-sized Navy submarine, is displayed as if it's surfacing out of the grass. ~42 miles from Orange Park. ~81 miles from Orange Park.